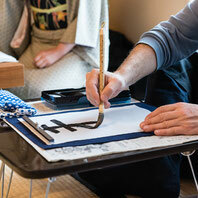 Calligraphy is one of the traditional Japanese cultures. It's a simple art form to write letters with black ink on white paper. However, the form of the art work can vary greatly according to the person who creates it, which is another charm of calligraphy. 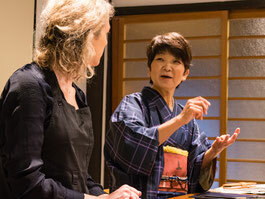 Nowadays foreign people are often fascinated with calligraphy feeling an attraction to the design properties of kanji (Chinese characters). 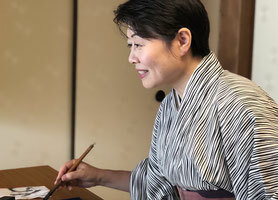 You may believe that painting kanji characters is very difficult, but it's not the case when you approach it as if you were drawing a pictograph or picture since kanji was originally a set of hieroglyphs. Even beginners can create a beautiful work of art under the careful guidance of our instructors. It has been scientifically proven that ink aroma soothes the mind. 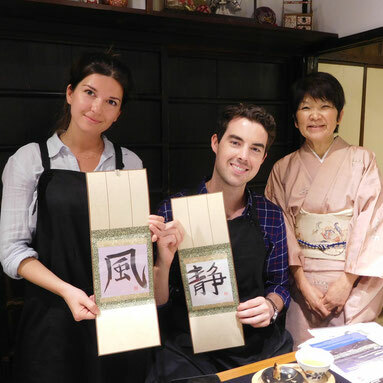 Why don't you make your own calligraphy work while spending a relaxing and peaceful time in a traditional Kyoto townhouse? It is sure to become an unforgettable memory of your visit to our ancient island country. 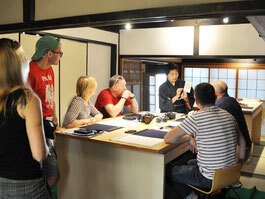 Introduction of essential knowledge about calligraphy including some history and background. Watch our demonstration and learn some basic techniques. Create your own calligraphy art work! The pieces you make will become your special souvenirs. Please make your online reservation by 5:00pm two days before the desired day of your booking. 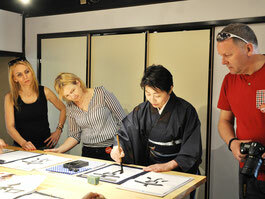 You can be an artist with a brush, and joy and laughter in our calligraphy class!